You can’t miss us now! ABOPS Belinda Phetha and Belgium volunteer, Kim Klaes, ‘Like’ the new Sanctuary road sign erected in February 2013! The Durban-based branding company (with a difference!) Big Eye Branding was founded by twin brothers Roger and Matthew Fitzsimons. Big Eye Branding makes great EXPERIENTIAL BRANDING EQUIPMENT designed to engage, interact and entertain your customer and ensure that your brand gets noticed. This they have certainly provided for us at ABOPS with new ‘designer’ umbrellas, flying and roll-up banners to help us ‘up our game’ for our awesome birds. 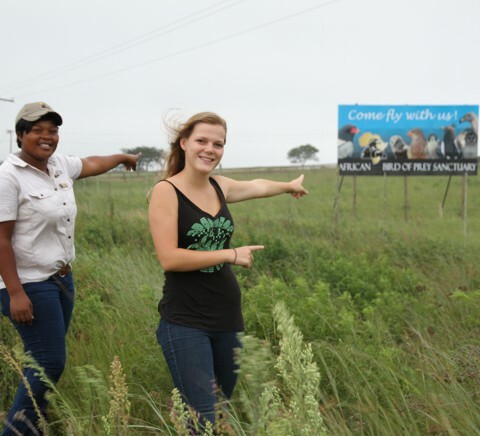 The ‘Big Eye’ brothers also solicited the assistance of Mark Dain from ScreenFast Screen Printers to donate a not-so-small billboard for the African Bird of Prey Sanctuary roadside so potential passers-by cannot miss us! Thank you to both Big Eye Branding and ScreenFast for their marketing support.